Aside from devouring your body weight in chocolate and hot cross buns, the Easter long weekend means plenty of time to catch up on House of Cards on Netflix, long sleep-ins and spending a little time in the kitchen. This Easter we've got the recipe to help you impress your friends (and your stomach) with your cooking abilities. 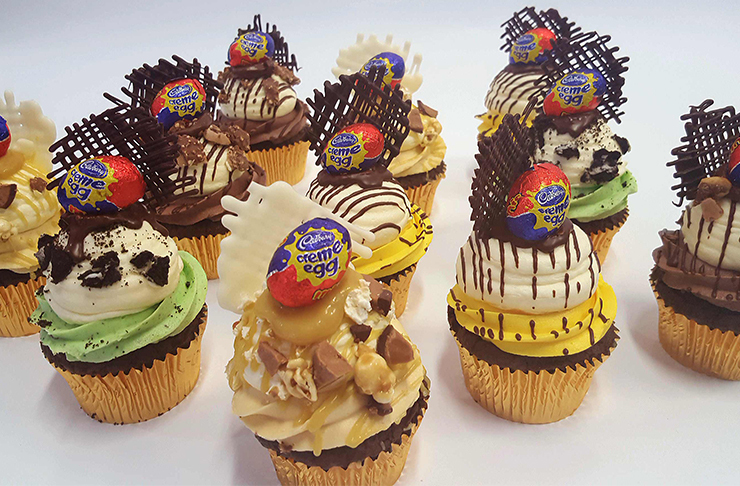 Trust us, these epic Cadbury Creme Egg cupcake creations made by uber talented Perth baker Laura from Creme De La Creme are freaking delicious and will ensure a sugar rush straight to the head. Preparation: make sure you freeze the Cadbury Creme Eggs at least the night before. Preheat the oven to 180 degrees. Line a standard muffin tray with 12 patty pans and set aside. Sift together cocoa, flour, sugar, baking soda and salt into a large bowl. Add eggs, warm water, buttermilk, oil and vanilla and mix until smooth—approx. 3 minutes. Scrape down the sides and bottom of bowl to ensure batter is well mixed. Divide batter evenly among muffin cups—it’s easy to use an ice-cream scoop that manually does the work for you. Pop the Cadbury Creme Eggs on top of the holes and lightly push them down, don’t worry if they aren’t fully covered by the batter, they will sink. Bake until tops of muffins spring back when gently pushed approx 20 mins. Transfer to a wire rack immediately after coming out of the oven, this ensures they don’t continue to bake. For the icing, beat room temperature butter for 7 minutes until white and creamy looking, the longer you beat the better. Add the icing sugar one cup at a time, mixing well between each cup. Add the vanilla extract and split the icing into 2 bowls, adding the desired yellow colouring to one bowl (make sure you add the smallest amount at a time and keep adding until you're happy with the colour) while keeping the other plain. Place the frosting into a piping bag. For our base coloured icing we have used a 1M Wilton tip and for the plain white icing we have just used a basic circle tip. Swirl the coloured icing around to create a rose flower effect by starting from the center and swirling around towards the outer edge of the cake. Next, with the plain icing, pipe a dollop in the center, creating a big blob on top of the yellow coloured icing. Decorate with chocolate sauce and a crushed Cadbury Creme Egg! Have fun by taking your cupcakes to the next level and adding your favourite flavours. Here are some of our favourite designs! Nutella Rocher: Just add Nutella, crushed Ferrero Rochers, chocolate lattice, chocolate icing (just add Nutella to your icing instead of the yellow colouring). Salted Caramel Lindt Popcorn: Just add, salted caramel sauce, caramel popcorn, white chocolate lattice, salted caramel Lindt balls, salted caramel icing (just add salted caramel sauce to your icing instead of the yellow colouring). Choc-Mint Oreo Smash: Just add, peppermint essence, chocolate lattice, green food colouring, crushed Oreos, mint Oreo icing (just add crushed Oreos, peppermint essence and green food colouring to your icing instead of the yellow colouring). Looking for more sweet treats? Here's 30 Perth Desserts You Must Try This Year!